As climate change effects grow more pronounced, there can be little doubt that an industry that produces 68 percent of human greenhouse gas emissions will find itself under increasing pressure. 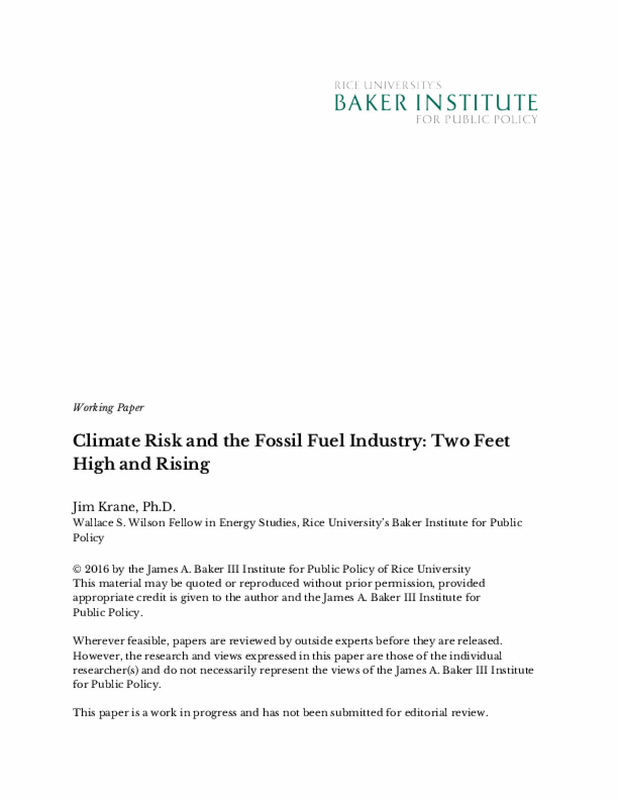 The risks to the industry correlate with progress on climate goals. Unless a technological breakthrough can restrict carbon releases, the fortunes of the fossil fuel industry and the stability of Earth's climate will be locked in a zero-sum game. Climate's gain is the industry's loss and vice versa. For coal, the threats posed by climate action are already being felt. Coal's fortunes now rest with developing countries, where decisions to seek China-style, coal-led development will increasingly be met by international pressure to choose an alternate path. Copyright 2016 by the James A. Baker III Institute for Public Policy of Rice University This material may be quoted or reproduced without prior permission, provided appropriate credit is given to the author and the James A. Baker III Institute for Public Policy.